According to recent statistics from studies conducted by the Centers for Disease Control and Prevention (CDC), approximately 300,000 people are infected with the bacterium that causes Lyme disease each year in the United States, though only about 30,000 cases are reported to the CDC. The disease can be difficult to diagnose because many of its symptoms can also be caused other diseases and the telltale red bull’s-eye rash associated with Lyme disease does not occur in nearly a quarter of cases. 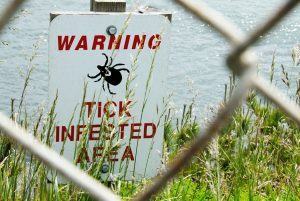 Now, researchers at Columbia University have found another factor that may make diagnosing Lyme disease more difficult. The study was conducted by a team of eco-epidemiologists who were examining the geographical expansion of black-legged deer ticks beyond the northeastern U.S. and Midwest and the wider spread of several tick-borne diseases. They found that in addition to being infected with the Borrelia burgdorferi bacterium that causes Lyme disease, a growing number of ticks are also infected with a parasite known as Babesia microti, which causes the disease babesiosis in humans. They found that mice infected with both Borrelia burgdorferi and Babesia microti were more likely to transmit babesia to ticks, which in turn increases the likelihood of the transmission of the parasite to humans. People who are infected by a tick bite with both Lyme disease and babesiosis often have more severe symptoms. In addition to the symptoms that babesiosis shares with Lyme disease, it can also cause sweats, loss of appetite and nausea. The parasite infects and destroys red blood cells, which in turn causes hemolytic anemia. This form of anemia (red cell destruction) can cause jaundice. Because this disease has been relatively uncommon in the U.S. to date, diagnosis can be missed. Often, the expertise of a specialized reference lab, like the one at the CDC or a local health department, is required when testing blood samples for the presence of the parasite inside red blood cells. The most effective way to battle all tick-borne diseases is by preventing tick bites. When outdoors, avoid high grass and brush. For adults and teens, wear insect repellant that contains 20 to 30 percent DEET or an effective alternative on all exposed skin and clothing. For children, ask your pediatrician what types of insect repellant are appropriate. When you come indoors, check your body, hair, clothes, pets and gear for ticks and wash all clothes, then dry on high heat. If you think you may have been exposed to Lyme disease or another tick-borne pathogen, a health advisor can connect your with an experienced physician who has expertise in diagnosing and treating these diseases.